Fit all 25 pieces into place before the 60-second alarm sounds. Even adults will be challenged by attempting to fit all 25 pieces into place before the 60-second alarm sounds. 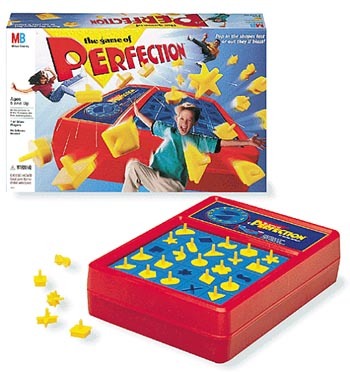 These complex geometric shapes need to be matched with the appropriate hole before the whole tray pops up and sends them flying in an explosion of yellow plastic. Any number of kids can take turns trying to beat the clock, and then to beat each other's best times. For younger children who are still learning to recognize shapes, the game can be played without the time pressure. Kids will soon develop speed and accuracy so much they'll want to take on Mom and Dad.